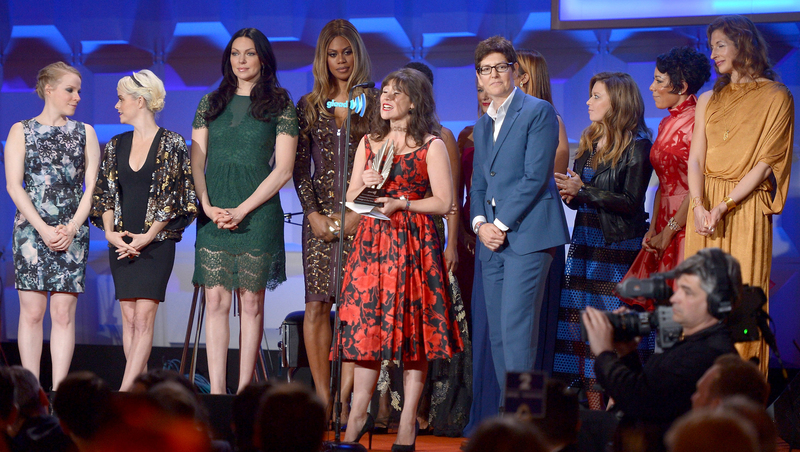 GLAAD celebrates "Orange Is the New Black." The Netflix show set in a women's prison was named outstanding comedy series at the 25th annual GLAAD Media Awards' New York ceremony. Cast members -- including Laverne Cox, who won her own GLAAD honor at the organization's Los Angeles awards ceremony last month -- accepted the award Saturday at the Waldorf Astoria hotel. George Takei received the Vito Russo award, presented to an openly gay media professional for promoting equality for the gay, lesbian, bisexual and transgender community. Other winners Saturday included the films "Concussion" and "Philomena" and Oprah Winfrey's interview with openly gay professional basketball player Jason Collins. An episode of CBS' "Elementary" took home the honor for outstanding individual episode. The GLAAD Media Awards recognize fair, accurate and inclusive representation in media of the LGBT community and the issues that affect their lives. Go here for the complete list of winners.